Deborah Kass (born 1952) is an American artist whose work explores the intersection of pop culture, art history, and the self. “The fact that this particular work resonates so beautifully in so many languages to so many communities is why I wanted to make it monumental,” Ms. Kass said. … Ms. Kass’s new sculpture is made of simple aluminum and paint. It will sit on the park’s renovated Main Street Lawn and stand until August. 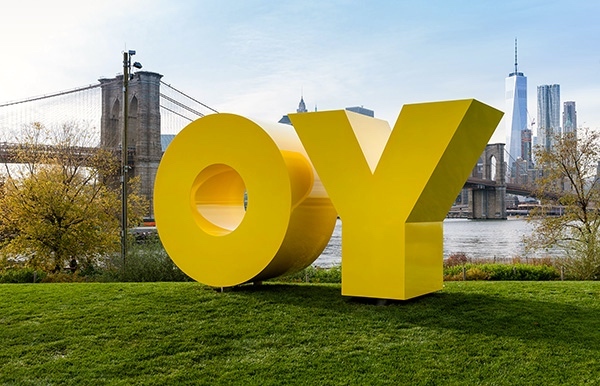 Ms. Kass said the sculpture might reflect Brooklynites’ “exasperation” with the neighboring borough that many older residents still refer to simply as “the city.” But she quickly recanted, saying that the sculpture was best left open to interpretation. The Ruscha connection. I’ll come back to OY and YO in a while. 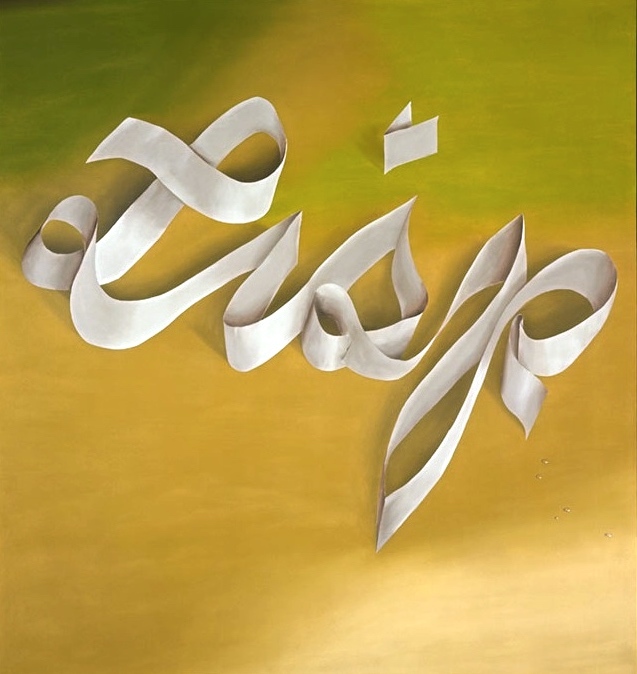 But first, a lengthy digression on Ed Ruscha, whose work I’ve enjoyed for many years; 5/4/11 posting on this blog about his work. Rarely uttered aloud, the work “oof” belongs to the world of comic strips, not the great literature and art, and particularly not to painting. We expect the emphatic word to appear wrapped in a speech bubble with an exclamation point at the end, but Ruscha has dedicated a large-scale painting [71 1/2 x 67″] to it as if it were worthy of veneration. 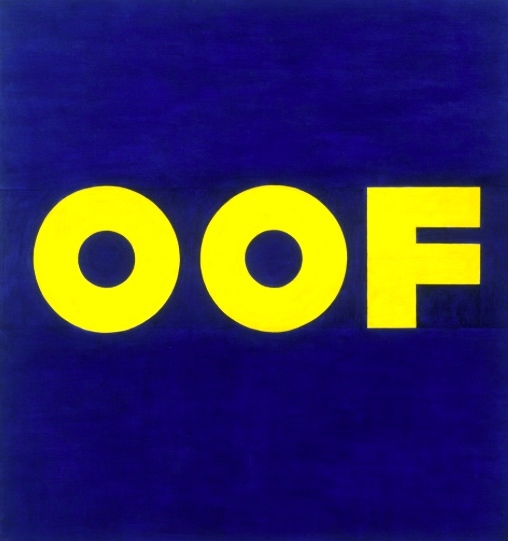 Of his work from this period Ruscha has said, “I was interested in monosyllabic word sounds that seemed to have a certain comedic value to them.” In capital letters, “oof” floats against an empty blue backdrop, suspended somewhere between image and language and between iconicity and absurdity. If you need cheering up, go to the Museum of Modern Art and look at a painting called “Oof,” by Edward Ruscha. The title and the subject are identical, just those three block letters, each one bigger than your head, in cadmium yellow on a background of cobalt blue. The six-foot-square canvas currently hangs in Gallery 19, on the fourth floor, along with Roy Lichtenstein’s “Girl with Ball,” Andy Warhol’s “Gold Marilyn Monroe” and “Orange Car Crash Fourteen Times,” and other Pop Art trailblazers of the early nineteen-sixties. “Oof” outdoes them all in its immediate, antic impact. This is not the kind of picture that reveals hidden depths on subsequent viewings. Everything is right there, every time, and it never fails to make me feel good. He made a few Johns-influenced paintings. One showed a can of Spam rocketing through space; in another, a real box of Sun-Maid raisins was flattened on a canvas, above the partly painted-over place name “Vicksburg.” Very soon, he zeroed in on the Johnsian notion of painting words. Peter Sokolowski, the editor at large of Merriam-Webster, said that both words had long histories, though “oy” only became “a naturalized citizen of English” in the 1890s. He dated the use of the English word “yo” to as far back as the 15th century, when it was in use in Middle English. Mr. Sokolowski was enthusiastic about both words. “I love dictionary definitions of monosyllabic interjections,” he said. yo, on the other hand, is something of a morass. Yes, it was used in Middle English, where it was a variant of yes (and yea), but it seems most unlikely that current uses of yo for affirmation are simple continuations of the Middle English. Another source for yo is as a phonological variant of the pronouns you and your — in use by black speakers since slave times, and still in use by some today (“Yo Momma!”). Another source for yo is onomatopoetic (like oof), representing a noise made when expending effort in some difficult task. This gives us the pop-culture pirate’s yo, as in “Fifteen men on a dead man’s chest / Yo ho ho and bottle of rum!” in Robert Louis Stevenson’s Treasure Island (1883). Yet another source is as a noise of connection: for attracting attention (similar to hey! ), expressing greeting (similar to hi! ), or acknowledging your presence (as in roll calls, where it can substitute for here!). I myself can use ho in all of these functions. Modern uses of yo in these functions seem to owe a lot to its use by Italian-Americans in Philadelphia, as represented by the speech of the fictional Rocky Balboa in the Rocky films (starting in 1976): “Yo, Adrian, I did it!”. In any case, it has spread to other places (including NYC) and other ethnic groups. And from the late 20th century on, it’s been a feature of hip-hop and of AAVE more generally, where it can appear as a sentence-final affirmative particle (“I’m tough, yo”). A recent development, reported on in scholarly writings and summarized in a 1/7/08 Language Log piece by Mark Liberman (note: almost eight years ago, potentially a very long time in vernacular language use), is as a new gender-neutral 3rd-person pronoun among young people in Baltimore (and now, possibly, in other places as well). I can’t tell whether this has anything to do with 2nd-person pronominal yo, or whether we’re just looking at the inevitable coincidences that will crop up when very short items get used in very common functions. This entry was posted on November 13, 2015 at 4:15 am and is filed under Art, Interjections. You can follow any responses to this entry through the RSS 2.0 feed. You can leave a response, or trackback from your own site.